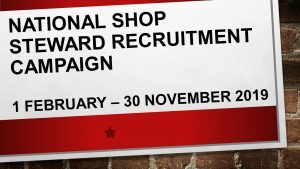 As part of the National Recruitment and Retention Strategy this year, the National Office would like to identify and reward IMATU’s top shop steward recruiters. As this is a pilot project, the costs will be borne by the National Office. Recruitment figures from 1 February – 30 November 2019 will be tallied to determine the top candidates. 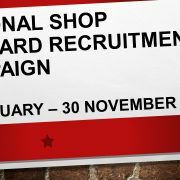 Prizes will be awarded to the top shop steward recruiter(s) for each Region, provided they meet minimum recruitment requirements. Qualifying recruiters will also be entered into a lucky draw system to receive monetary prizes. 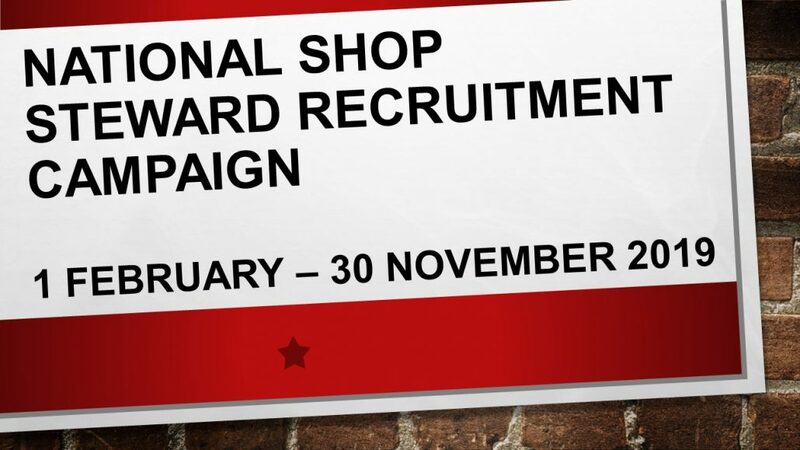 This campaign will be limited to recruitment by shop stewards. All recruitment figures must be recorded monthly via the correct Regional Shop Steward Recruitment Report. The campaign will run from 1 February – 30 November 2019. The target is for each shop steward to recruit a minimum of 10 (ten) members during the campaign. Changes to the local government landscape and growing competition for new members has necessitated the recruitment of Expanded Public Works Programme (EPWP) workers, Contract workers, Interns, Apprentices and other temporary workers, hereafter all referred to as “temporary workers”. The recruitment of temporary and/or allied workers will be permitted to count towards a recruiter’s total recruitment figures during national campaign periods. Therefore, all members that are recruited during a campaign period will be counted towards a recruiter’s total figure however, the Region must reflect permanent employees and temporary workers separately in their monthly membership statistics. All temporary members recruited must be captured and displayed in the ‘Allied’ row of the monthly membership recruitment report. Regional Managers are reminded of the guidelines for the recruitment of temporary workers, as set out in the SOP circulated on 13 December 2016. While the Region is not paying over any additional incentive to recruiters, recruitment and loan practises must adhere to the stipulated guidelines provided. It has been noted by the National Executive Council that recruiters based in Metropolitan areas or large cities have a proximity advantage over recruiters operating in the non-Metro areas with vast geographical spaces between relatively small municipalities. Further challenges to recruiters based in non-Metro areas include limited new entrants to the sector and smaller pools of possible members. In a bid to address this discrepancy, top recruiters will be divided into individuals recruiting in a Metro area (i.e. City of Joburg, City of Cape Town, eThekwini, Ekurhuleni, City of Tshwane, Nelson Mandela Bay Metro, Buffalo City Metro, Mangaung), and non-Metro areas. Recruiters from non-Metro areas will also be set smaller recruitment targets for the purposes of qualification and awarding of top recruitment prizes. Recruiters will be incentivised by individual cash rewards. Qualifying recruitment targets have been set in order to make targets attainable as well as encouraging maximum participation. The shop steward, based in a Metropolitan area, who recruits the highest number of members in his/her Region during the period of the campaign, provided that they have recruited a minimum of 40 (forty) members each, will be awarded a cash prize of R 5000. The shop steward, based in a non-Metropolitan area, who recruits the highest number of members in his/her Region during the period of the campaign, provided that they have recruited a minimum of 20 (twenty) members each, will be awarded a cash prize of R 5000. R 1 500 each will be given to twenty (20) Metro and twenty (20) non-Metro recruiters who have recruited at least 15 new members each, during the campaign period.